Designs by Lisa Somerville: Bloggers Challenge - It's Manly Baby! Bloggers Challenge - It's Manly Baby! Happy Bloggers Challenge Friday, thanks to those who played along with last weeks sketch challenge (one of my favorite types of challenges) it's always wonderful to see how everybody interprets of a sketch! With Father's Day this weekend, some of you might have already guessed this weeks challenge, seems quite popular for Challenge Blogs this week. Anyhow, this weeks theme is to create a Masculine card or project. Not only do I need a Father's Day card for my FIL, but his birthday was yesterday, so my card does double duty! I used this fabby Wallet Template for my project. I cut mine with the Silhouette, but just so you know the templates are also available as PDF files, so you can use them without an electric cutting machine. I embossed the whole piece with a Texture Fades Folder (embossing in sections so the whole piece would be embossed), then highlighted the embossing with Walnut Distress Ink. I think it would be fun to also distress the edges, to age it a bit, but that was an afterthought. For the inside I used the Time set from Our Daily Bread Designs, along with this weeks ColourQ colors, making my own Designer Paper for the insert, which happens to be this weeks Stamping in Time Challenge at Our Daily Bread Designs. If you'd like to play along with this weeks Bloggers Challenge, please link back to this post on your blog and mention you created your card for the Bloggers Challenge - Masculine Challenge. Please add your link using the Link Tool below. Just a note on the link tool, your link should be a direct link to your Bloggers Challenge Post, use your name as the Title. Please do not link to cards that were created prior to the challenge date. Entries not linking properly will be removed. Love the look and feel of the wallet! Awesome gift for Dad! This is fabulous, Lisa! 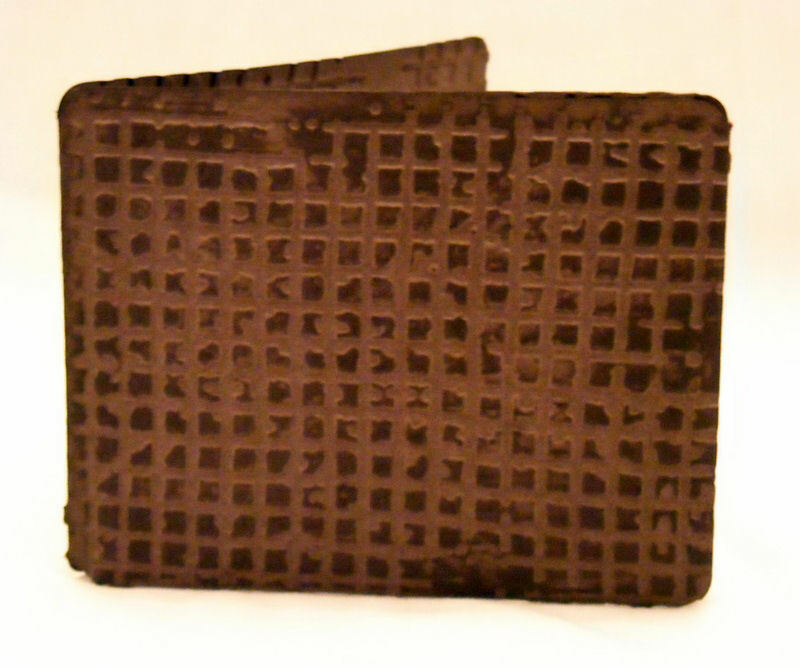 The embossing folder gives the wallet the perfect texture. Great gift idea, love the embossed leather look on the front. The wallet is so realistic. Perfect man's gift. What a fun manly card. Very nice to hold a gift card at a manly store. Very nice gift Lisa... Well done! What a cool looking wallet, Lisa! Love it!!! Wow this really looks authentic. Love the texture you achieved. What a wonderful gift card holder for a guy. This is fabulous, Lisa. Unique and beautifully created!! Brilliant, Clever, Amazing! Love this most perfect creation for a guy! Your FIL will just flip over this, well as much as guys flip over these types of things. Love the leather look! Awesome Lisa, I can almost smell the leather! Looks so real! You're too fabulous! What a great idea! I really need to try to do this--love the way you got it to look so real. Thanks for the close up's! Love your faux wallet, Lisa! Hope your fil appreciates the work. Thanks for joining us at the ColourQ this week. Great job. Brilliant, clever and adorable. Really amazing! Love this most perfect creation for something diferent for the men our lives!! Thanks for joining us at DDCC next week. Awesome project- what a great idea for a gift! Great challenge Lisa! Love this Lisa!!! What a great look! Fabulous - love the leather look! So glad you linked up at Craft Us Crazy! Awesome! Looks like the real deal. What a wonderful project....and it was perfect for this week's theme! Bet you FIL loved it? (What's not to love, right?!!) On another note, I had no idea you could download a template in the right format into the Silhouette! Cool idea! Now....I just need to learn to do that.